Note: below is a repeat of our postings of July 6th 2011 on the subject of "Protection from schizophrenia in the NPA model." The NPA traits are N (sanguinity, or narcissism), P (perfectionism) and A (aggression). We have been speaking of “protection” from schizophrenia (SZ), as in the paper* by Monakhov et al., but what exactly does this mean in the context of the NPA model? Protection from SZ arises when there is an excess of NA and NPA dominant types in the control group as compared to the SZ group. Note that the key issue is that there must be a substantial number of NA and NPA types in the general (control) population. A corollary of this statement is that in order for protection to be detected 1) in a sanguine area, the prevalence of the A trait must be moderate to high, and 2) in a non-sanguine area the prevalence of the N trait must nevertheless be substantial. That, is in a highly sanguine area where trait A is very low, all SZ patients and controls will be N and NP types, and the N trait cannot possibly show up as protective. 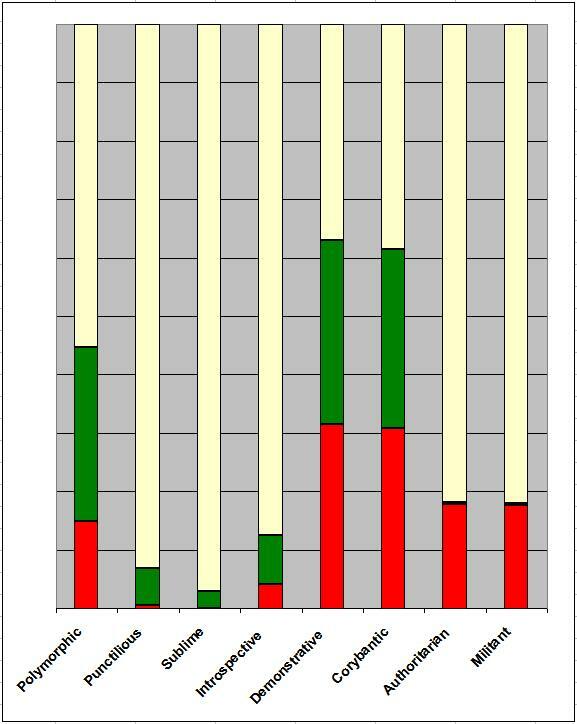 Conversely, in a non-sanguine area where the N trait is very low, all patients and controls will be A and PA types, and the A trait cannot possibly show up as protective. So, in general, both traits must be present to some extent for a protective affect to be discerned. The above shows that, practically speaking, protection from SZ by the A trait is least likely to be detected in the Sublime and Puctilious habitancies, simply because of the small numbers of NA and NPA types that would appear in the control groups. Somewhat counterintuitively, the most likely habitancies for detection of protection would be the Demonstrative and Corybantic habitancies because of the very high numbers of NA and NPA types that would appear in the control groups. But the exact numbers regarding protection would depend on the genotypes of the SZ individuals in each habitancy. Given the above, it is understandable why some studies will find "protection" and some will not. *Reference: Monakhov M, Golimbet V, Abramova L, Kaleda V and Karpov V. Association study of three polymorphisms in the dopamine D2 receptor gene and schizophrenia in the Russian population, Schizophrenia Research 100 (2008) 302–307. With regard to “protection” from SZ, I did some calculations to see what one could expect for the various habitancies. I assumed that the risk of SZ was 1% for all types, except NA and NPA dominant types where it was assumed to be zero. I calculated and compared the frequency (per 100 individuals) of trait N between SZ and the general population (“controls”), and also the frequency of trait A between SZ and controls. 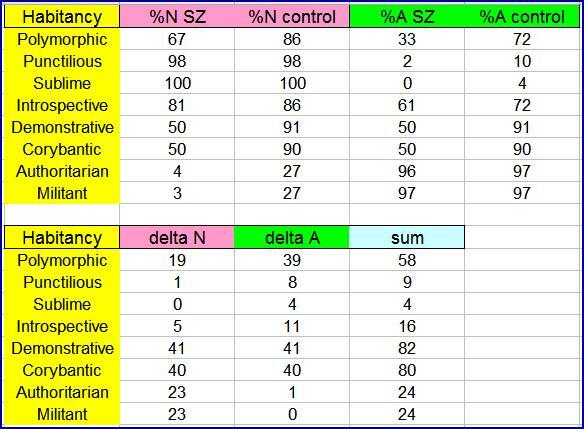 In the bottom panel is the difference (delta) in the traits N and A between SZ and controls. The magnitude of this difference is “protection” from SZ due to that trait. (Researchers would actually be testing for difference in genotypes and gene frequencies for statistical significance). I also added the two deltas together. The “sum” is a measure of the total genetic (N+A) difference between the SZ group and controls. Note that the largest deltas are seen in the Demonstrative and Corybantic habitancies, and the smallest in the Sublime and Punctilious habitancies. Note that delta N is nil in the Sublime and Punctilious habitancies, while delta A is nil in the Authoritarian and Militant habitancies. The Polymorphic habitancy is somewhere in between. In the Authoritarian and Militant habitancies the difference between SZ and controls is nevertheless sizeable enough to be detected in a delta N study, but not at all in a delta A study. Note finally the low deltas in the Introspective habitancy compared to the Polymorphic habitancy. This is because we have assumed that submissive types with the A- trait also have the same 1% risk of SZ, with submissive types therefore appearing in both the SZ group and the control group. Benis A.M. (1985, 2008). Toward Self and Sanity: on the genetic origins of the human character. Chapters 10, 11. Psychological Dimensions Press, New York.